We have configured appium project in eclipse during previous post. Now we are all set to create and run first appium software automation test script on android mobile device. In this steps we will learn how to create first appium automation softwre test script in eclipse and then run it in real android mobile device. PREREQUISITE : All previous 12 STEPS should be completed without any error. We will use android mobile phone's default installed calculator app to run appium software automation test script. You can download Android Calculator software App from THIS PAGE if it is not installed in your mobile. This is our first appium software test so we will create simple test to sum two numbers. Follow the steps given bellow. Before creating appium test for android software app, You need bellow given parameters of android device and app to set webdriver capabilities in test script. Find Android Device Name : As described in THIS POST, Connect your android device with PC and get device name by running adb devices command in command prompt. My android device name Is : ZX1B32FFXF. Find your device name. Find Android Software App Package Name : You can view THIS POST to know how to get android app package name. Package name for my calculator app (Which Is Installed in my android device) is com.android.calculator2. Find your app package name. Find App Activity Name : You can view THIS POST to know how to get android app activity name. Activity name for my calculator app (Which Is Installed in my android device) is com.android.calculator2.Calculator. Find your app activity name. Find Android OS Version : In your android device, Open settings -> About phone -> Android version. My device's Android version Is : 4.4.2. Appium should be installed and configured and also you need Server Address and Port number (which is used by appium) as described in THIS POST. 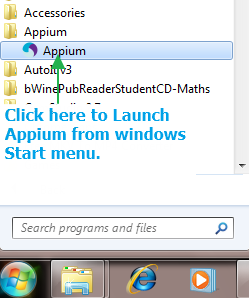 Launch Appium from Windows Start menu. For me, Server Address is : 127.0.0.1 and Port Number is : 4723. 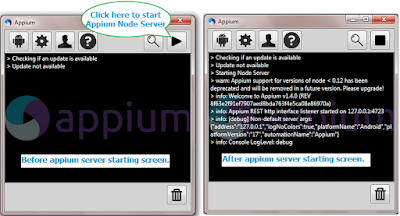 Click on Start button to start appium node server as shown in bellow image. It will take some time to launch node server. 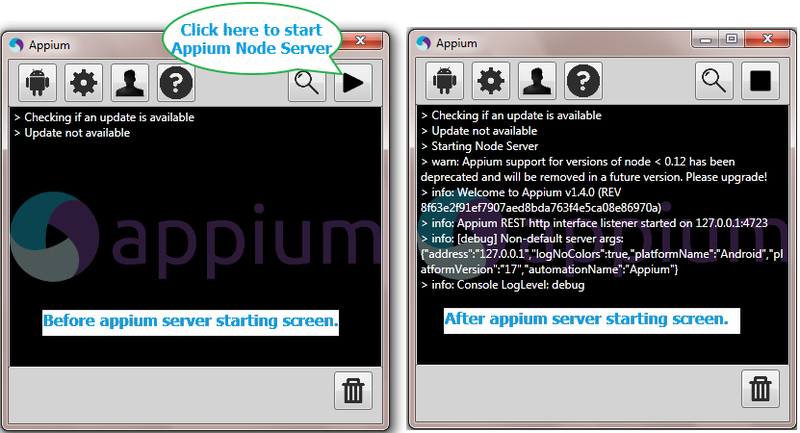 Note : You can consider appium node server is started properly once it shows log as shown in above image. I have created sample appium software test script using selenium webdriver to sum two numbers using android calculator application. Calculator app should be installed in your android device. Install TestNG in eclipse if it is not installed. View THIS POST. Also replace capabilities values of bellow given list with your own values in script. Otherwise it will not works. deviceName - Name of device which is connected with PC. CapabilityType.VERSION - OS version of your android device. appPackage - Calculator app's Package name. appActivity - Calculator app's Activity name. Now create bellow given test class under Android package of your appium project. Usage of each code syntax is given in script itself. // Get result from result text box. Note : Before running above script using testng, Please make sure your android device is connected with PC with USB debugging mode enabled and Appiun node server is launched and started. Open calculator app in your mobile device. Tap on buttons in this sequence -> CLR, 2, +, 5 and =. This way, We have executed very simple test script in android mobile device. If you have noticed in above example test script, We have used only name locator. We will use all different element locators (Which are described in THIS POST) in upcoming examples. These are awesome tutorials. Millions salute to u Aravind! Check your Spellings example :- you might have typed "devicename" instead of "deviceName"
Rerun test when you face above error. Try 2 to 3 times. I am ruining my first android script.I have done setup all 12 steps without any errors. But I am getting error like "A new session could not be created. (Original error: Android devices must be of API level 17 or higher. Please change your device to Selendroid or upgrade Android on your device.) (WARNING: The server did not provide any stacktrace information)". I am using samusung galaxy grand mobile with andoid 4.1.2 version. Appium supports only Android 17+ API level versions. You can use appium if your phone contain Android 4.2 or greater version. When i am executing my first test, i am getting an error is " error: Unhandled error: Error: ENOENT, no such file or directory 'D:\SDK;\build-tools'". Please help me on how to resolve this error. Hi Srinu, getting the same error. Did you resolve this issue? Hi, Aravind, Thanks I have learn lots from you. org.openqa.selenium.SessionNotCreatedException: A new session could not be created. (Original error: Command failed: C:\Windows\system32\cmd.exe /s /c "G:\Android\platform-tools\adb.exe -s 0123456789 install "G:\Program Files (x86)\Appium\node_modules\appium\build\unlock_apk\unlock_apk-debug.apk""
I don't where I am wrong, I am trapped here, could move forward. I use Appium+Java+Eclipse, and installed all staff, check environment with command Appium-doctor in dos window, all environment set correctly. when I run, it reported below error, can you help me out? Exception in thread "main" org.openqa.selenium.SessionNotCreatedException: A new session could not be created. (Original error: 'java -version' failed. Error: Command failed: C:\Windows\system32\cmd.exe /s /c "java -version"
Seems Java environmental variables are not configured. Run >> java -version in command prompt to confirm. Where should I include the code to do test in the above code you posted. I have an error "Error: Could not find or load main class org.testng.remote.RemoteTestNG". What I have to do? Thanks for the tutorial Aravind..Its really helpful..Really happy to execute my first mobile test.. Thanks for the tutorial.. Its really helpful.. Happy to execute my first mobile test. error is thrown while trying to execute the mentioned program. Hi i am getting the below error i gave the IP in the program and in appium server as the same but still it shows me the error. can anyone help me??? I am using Android 6.0 API level 23. Also I am using latest Appium. Please suggest. I have tried running the same calculator code provided with packagename,launcher activity changes (Changed all the values specific to device). Iam facing below issue.Unable to launch the app on device . Why have we added java client dependency in pom. Where as no where in the code are we using it. We have not even imported the it's libraries.